I a different post I posted that my dog ate chocolate ex-lax while lounging on my quilt top. I washed the offending chocolate and paw-prints off the top and tossed it into the dryer. 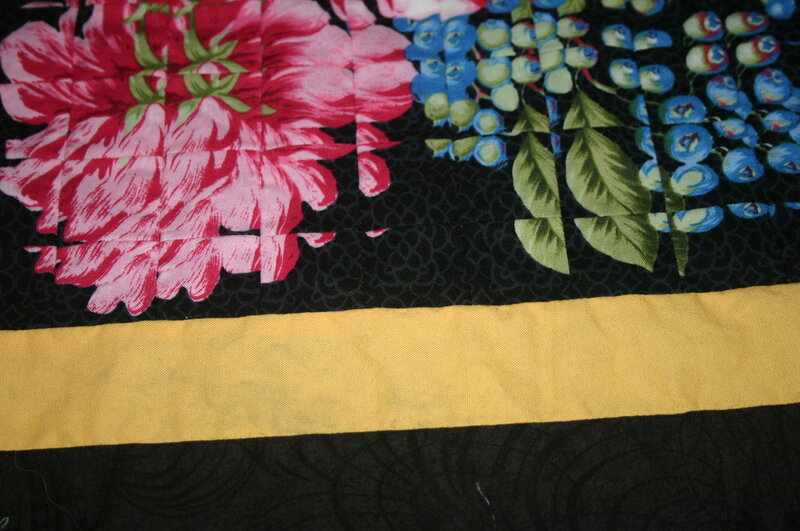 Well ... despite having pre-washed all of my fabrics ... the black bled onto the yellow border!!! Any suggestions?? Can I wash it again in synthropol? I don't like to wash quilt tops, especially this one having only 1/8" seams!! Synthrapol will probably remove the black from the yellow. However, Synthrapol requires the use of *lots* of ***hot*** water to work, and sometimes it takes more than one treatment to work completely. I would wait until the quilt is quilted before doing this. If you really feel you need to make sure the bleed comes out before quilting, then I would first machine baste the top to a muslin foundation to protect the seams from ravelling. I would use rubber gloves and hot water in a bath tub (or a large sink, if you have one) to give it the Synthrapol treatment. Edit: I should add that I really do think that Synthrapol will remove the bleed easily. Even though you put the top in the dryer, heat probably did not set the stain; usually these dyes require chemical setting to become permanent. Thanks Prism. I hadn't thought of basting the top to muslin ... good thought!! Is it for something special or for yourself? 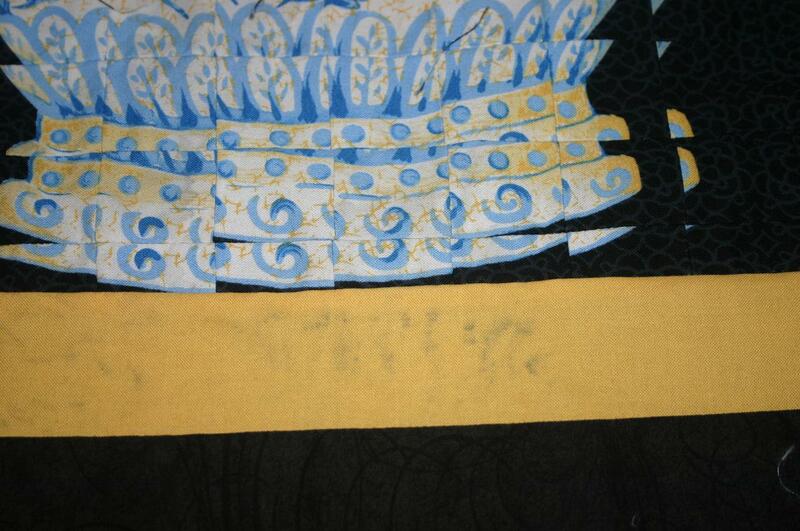 If it was for myself I think I would do some intricate quilting design in black on the yellow (hide bleed). You could also use a rubber stamp and fabric paint to put a floral design on the yellow in black. If you really want the yellow clean, I think I'd cut new strips and put them in. I would rather do that then take a chance of messing up your beautiful center. Good luck! I like Tartan's response. I'd try a small test area of the quilting like said above and if it works that would be the way I go. Did you use Color Catchers? I don't prewash and haven't had a problem with bleeding since starting using the Color Catchers. I do use 2 or 3 of them sometimes when I have black red or blue. To add to what Tartan said about cutting new yellow strips, I would use retayne first. I am sort of fascinated by this quilt and want a bigger photo. Can you post a photo of the whole quilt. What size are those squares? They look tiny. I swear by Color Catchers. I made my sister a sampler quilt in blues and whites and one of the blues ran really, really bad. My sister was about sick about it. I told her to wash it again and use the Color Catchers; she did and the blue came out..no more problems. It would be worth a try. my friend swears by Rit color remover. She says it does not change the color of the fabrics, just the dye that has run. You can find it by the regular rit dyes...I have even seen them at the grocery store. I swear by Color catchers, too. Please let us know how you handle the problem. I feel bad for you that the Color bled.